It's the final week of this term and we are all ready for a break! 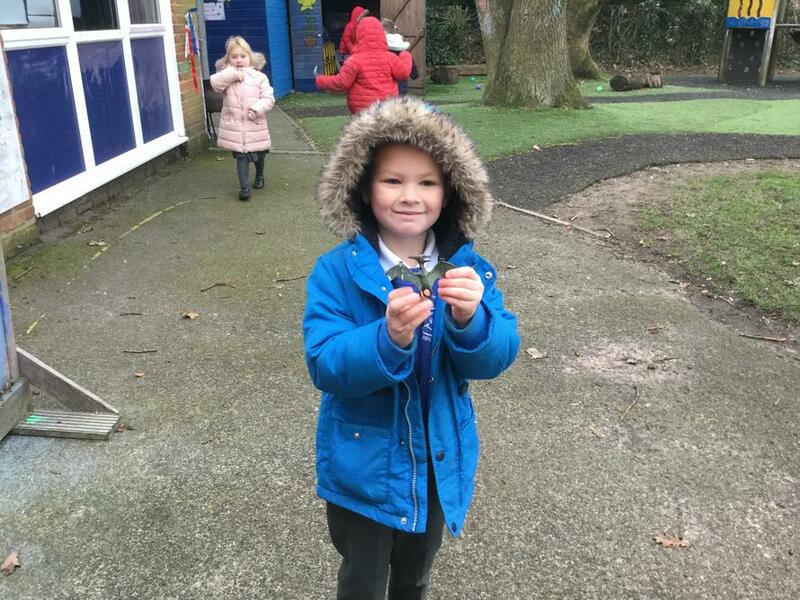 Well done to all the children for their hard work and trying out lots of different activities. 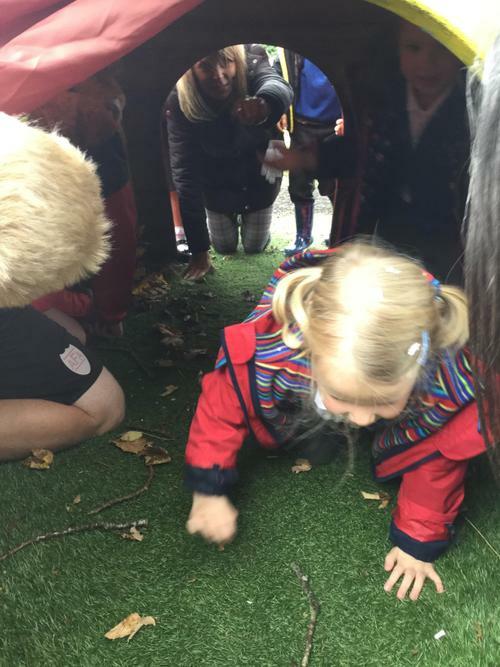 We have enjoyed the Circus topic so much and are looking forward to the next topic all about Minibeasts. This week was also learning about how to be healthy. 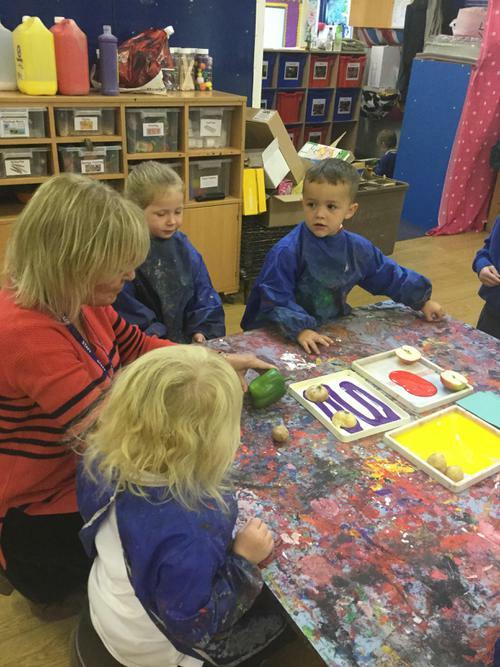 We had a few discussions about why pizza is not healthy but fruit and vegetables are. 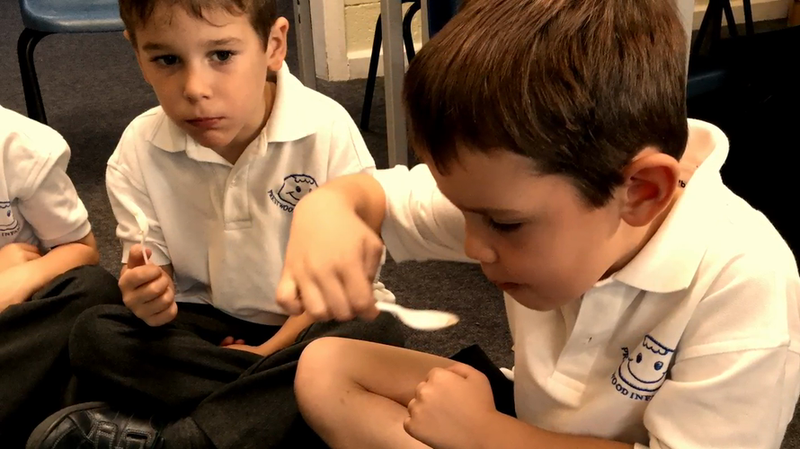 We tried a few new foods and some were a hit but others didn't taste so exciting. We also had an assembly on how to brush our teeth and not to eat too much sugar. Easter is soon upon us and now we know some things about Easter too. We had a fun Easter egg hunt and we are exhausted and totally ready for a rest...including our grown ups at school too. Have a fabulous Easter break everyone! A plea for junk modelling boxes. 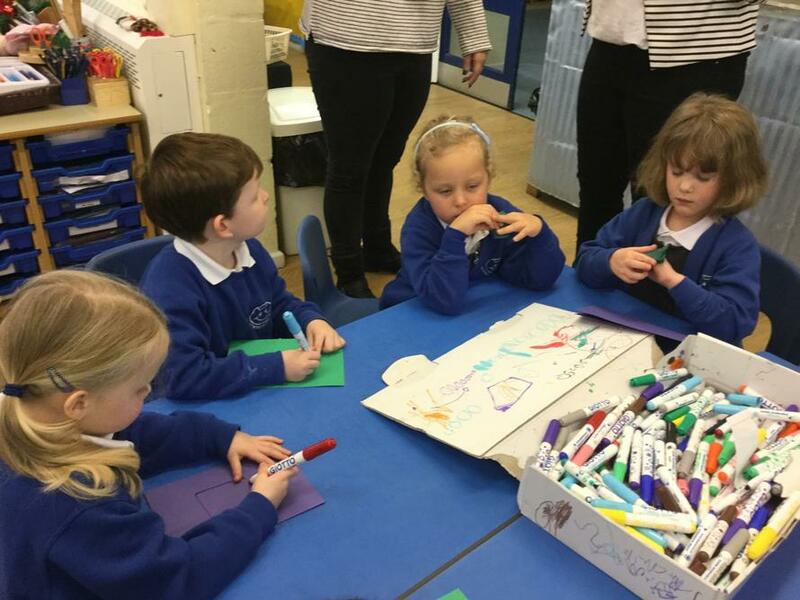 If you have any old packaging that we can recycle into junk modelling we would be very grateful as the children just love it! we can't get enough so if you have any clean empty boxes or packaging that is allergen free, please send it our way. 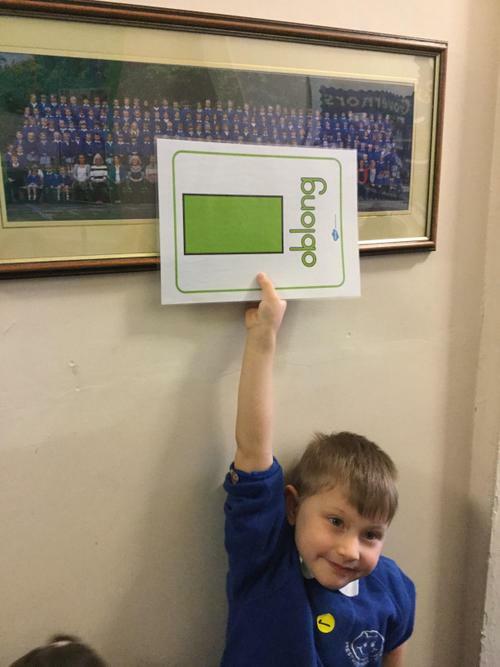 Don't forget to sign any reading records and remind the children to put their books in the boxes if they would like to get their books changed. 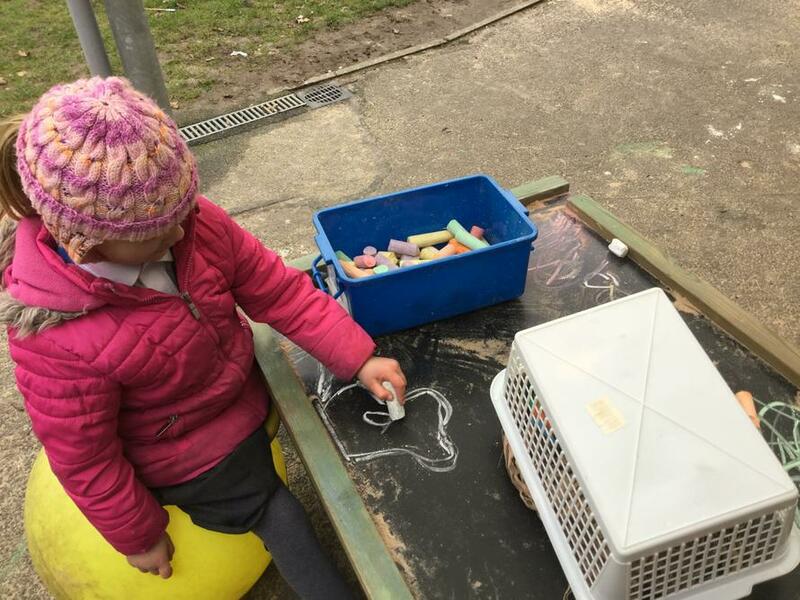 We are looking forward to seeing you at Stay and Play on Monday 1st and Tuesday 2nd of April. Enjoy your weekend. 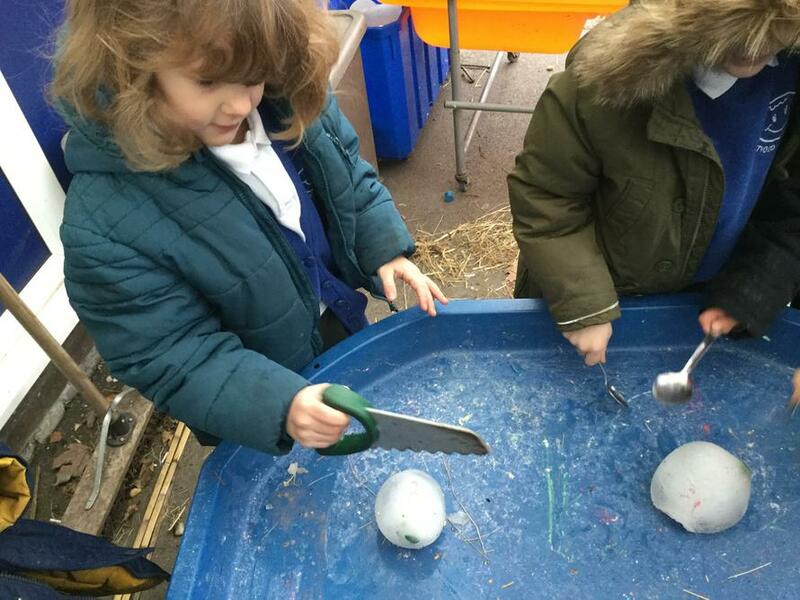 This is Science Week 2019 and we are having fun investigating the world and how things work in EYFS. 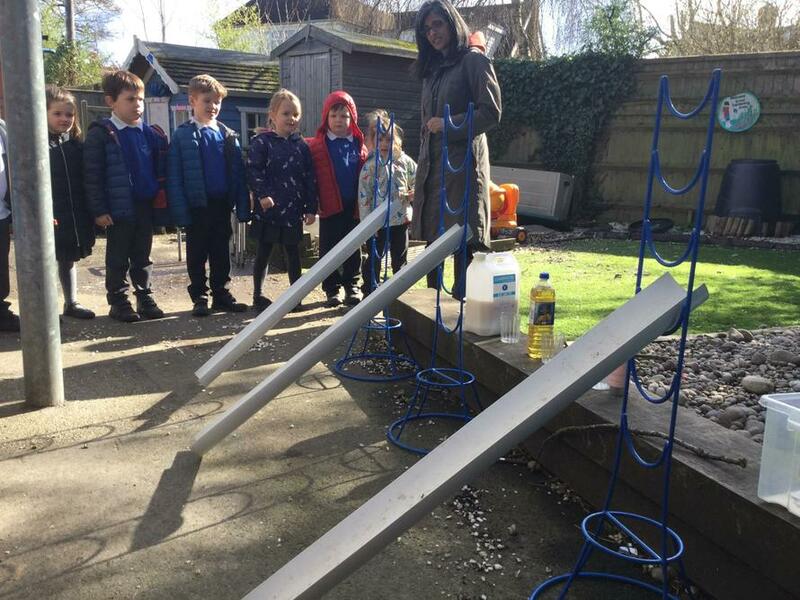 We found out how fast different liquids move using the Slippery Slopes investigation on Monday and on Tuesday we investigated which materials are best for being seen in the dark so we can keep safe. 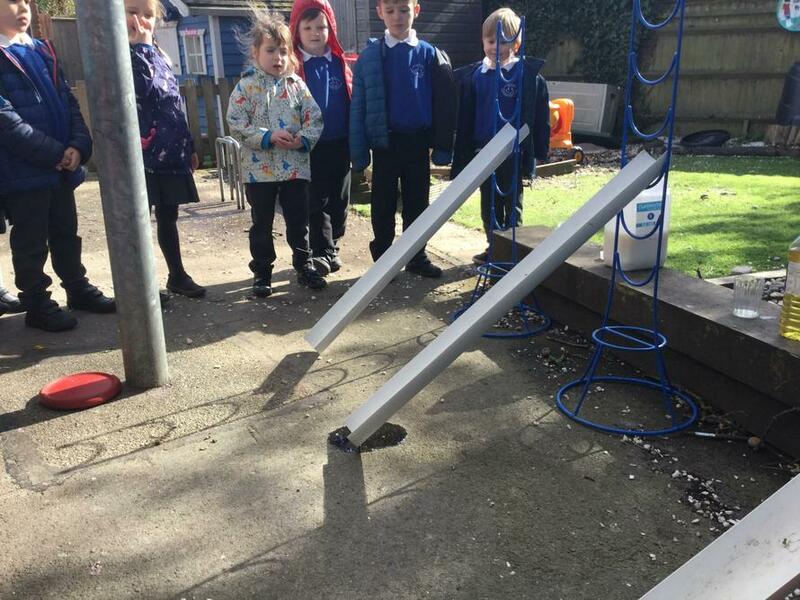 On Wednesday we looked at all sorts of interesting investigations, they were amazing! 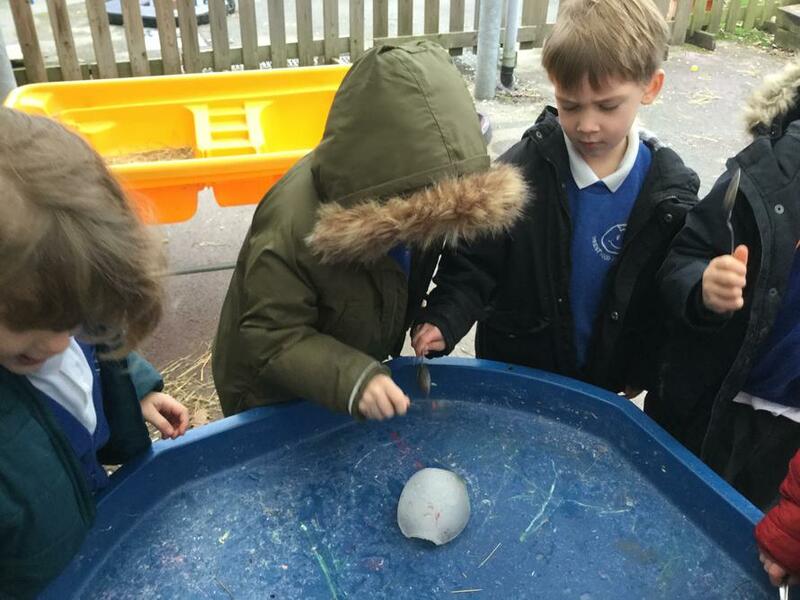 The children investigated different coloured materials and worked out which ones would be best to wear in the dark so that they could be seen and stay safe. Do oil and water mix? 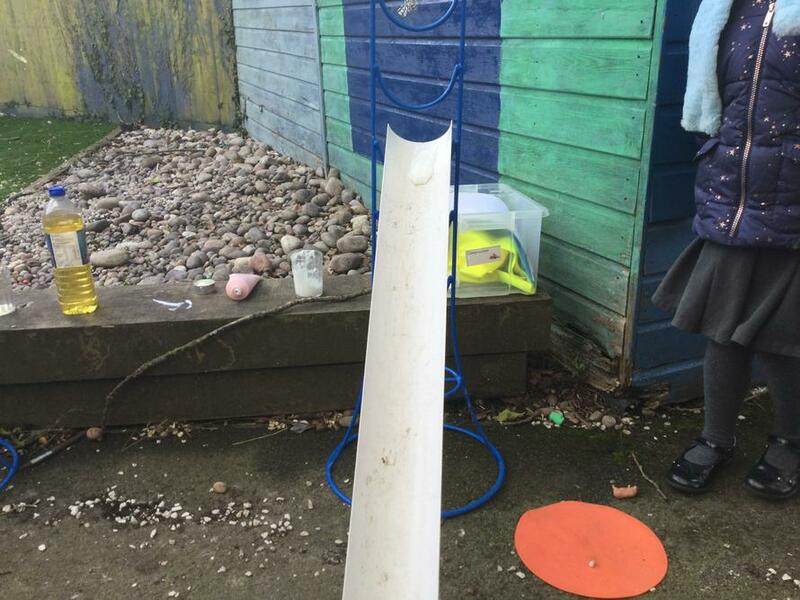 Roll up, roll up to our great new topic....Can you guess what it could be??? Of course, we have already dived into the exciting world of the circus and the types of entertainment found there. 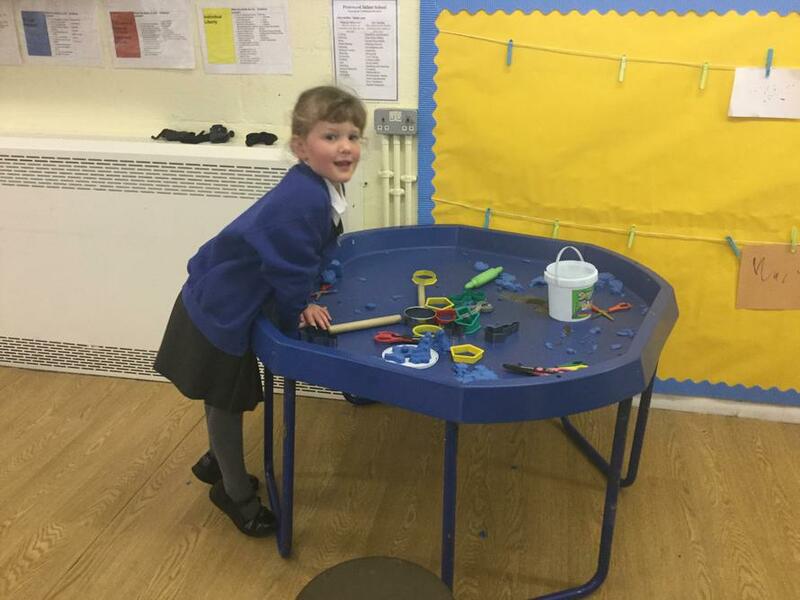 We have a fabulous Circus role play area which the children have begun to explore. 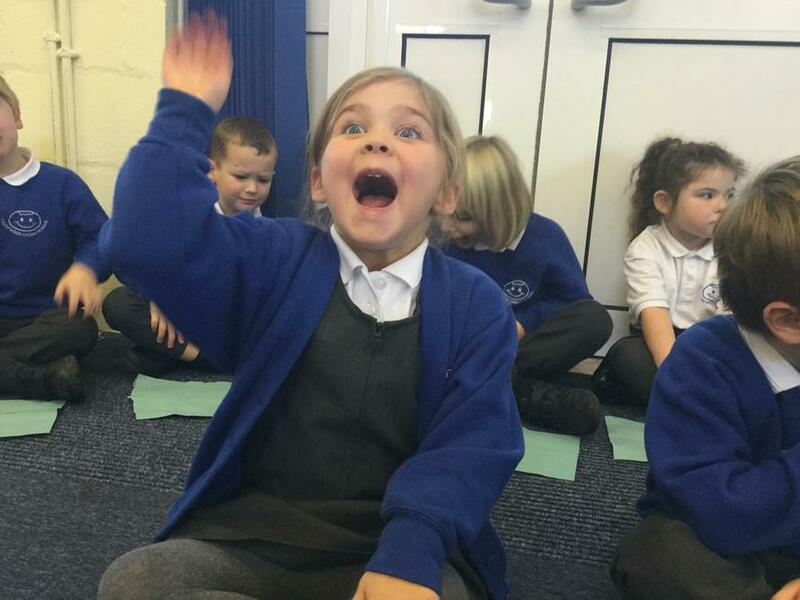 We are practising writing sentences and making clown faces from 2D shapes, there are circus acts everywhere! 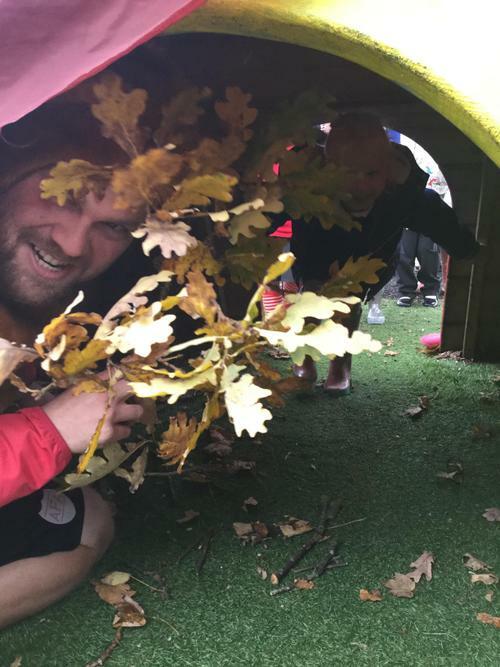 Come and see our greatest learning ever! What an amazing day we had transporting ourselves back in time to the days of yore. 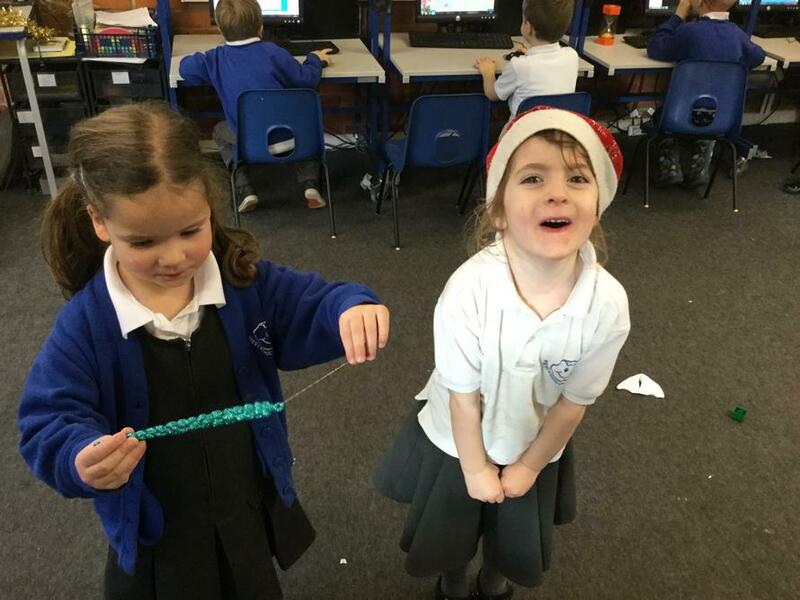 We made crowns and jam tarts, we learned a medieval dance and had a go at archery. In the afternoon we all got into our amazing medieval costumes and had a banquet. We had such fun and what an amazing day! 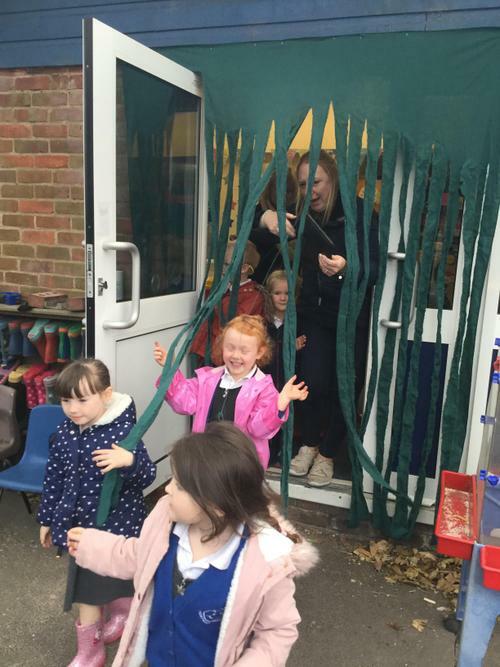 This week's hair raising fun! The fairy tale this week is The Frog Prince and it is a slightly different take on the traditional tale. 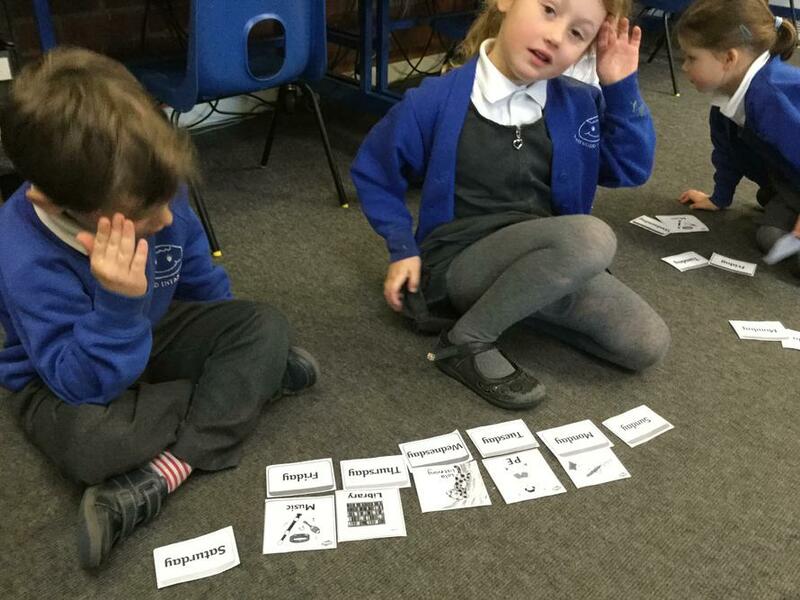 The classes helped to make a story map and then retold it in their own words.We even made up our own animal to substitute into the original story. 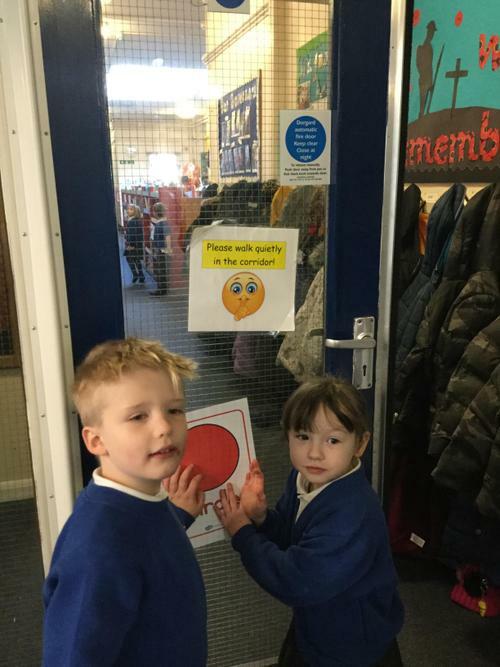 In maths we had a go at spotting patterns and continuing patterns too. 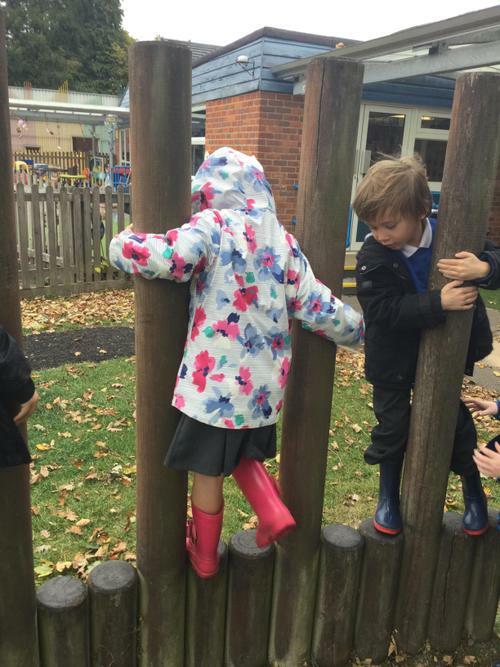 We soon got the hang of it! Don't forget that EYFS library day is on Tuesday and any books that require changing need to be brought in on Tuesday in order to be changed. Each child can have one book to take home to read however must bring the old book back before a new one can be issued . 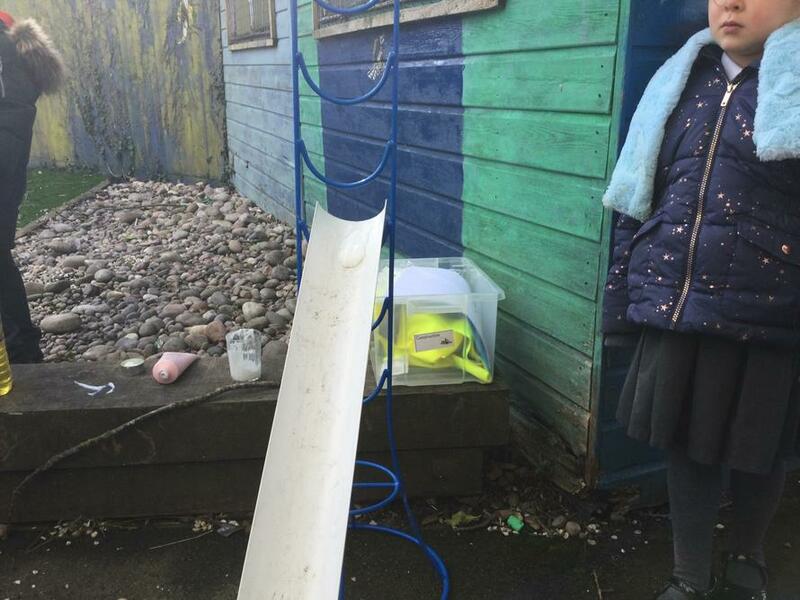 We would love to have your old recycling too as we are always in need of Junk Modelling materials. If you can give us any old cardboard boxes or containers that are wheat/dairy/nut free, we would be happy to take them off your hands. 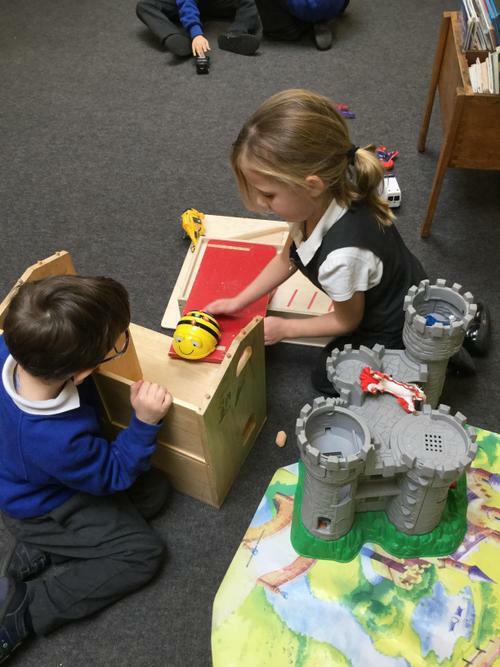 Helping build our role-playing castle area and having a go! A Happy New Year and welcome to 2019! We hope that you had a great festive holiday and although Christmas and New Year can be very hectic, we are sure that you are all raring to go! 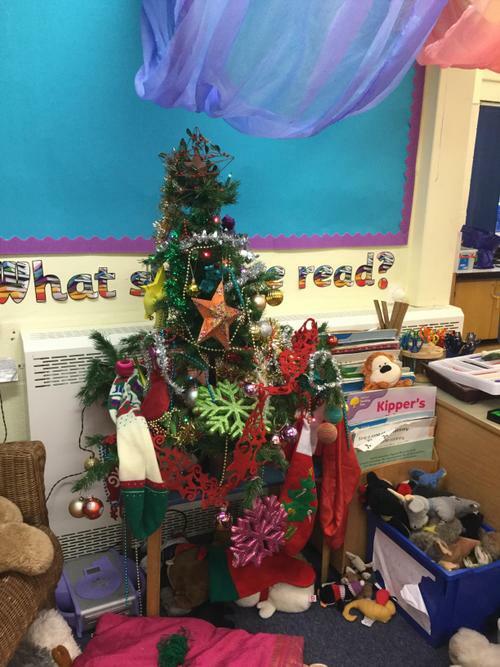 from all the Reception EYFS staff for the generous gifts given to us. You have been ever so lovely and lavish and we really appreciate your kindness. 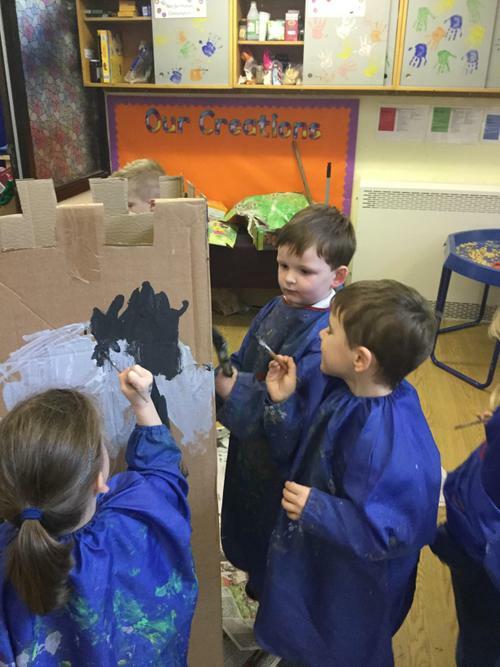 The Spring 1 half term topic is Castles. We will be finding out facts about castles as well the type of things that went on inside them, who lived there and their purpose. 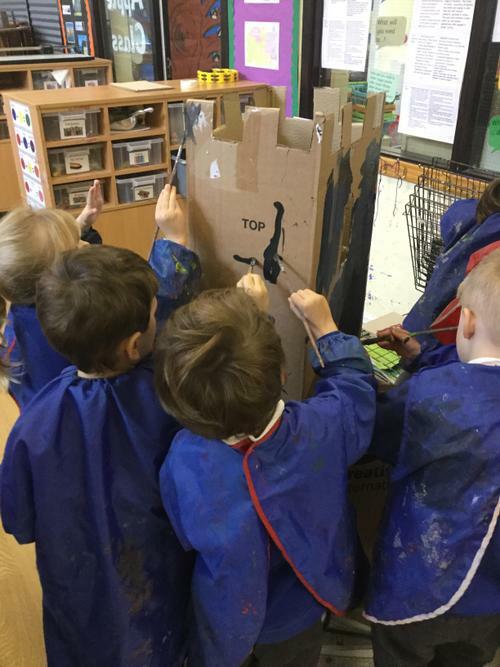 We will link all other learning to our castle topic and its going to be so much fun! 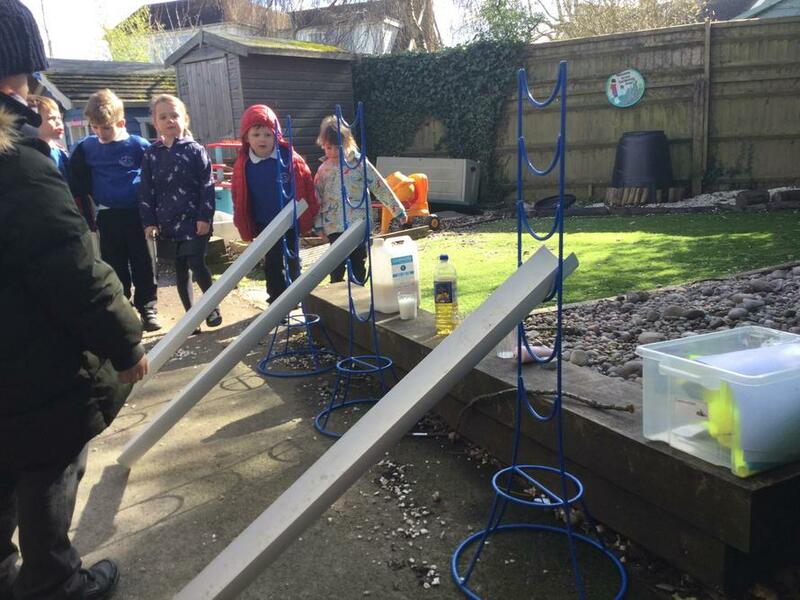 You can find out the things we are going to do on the Spring topic letter below. 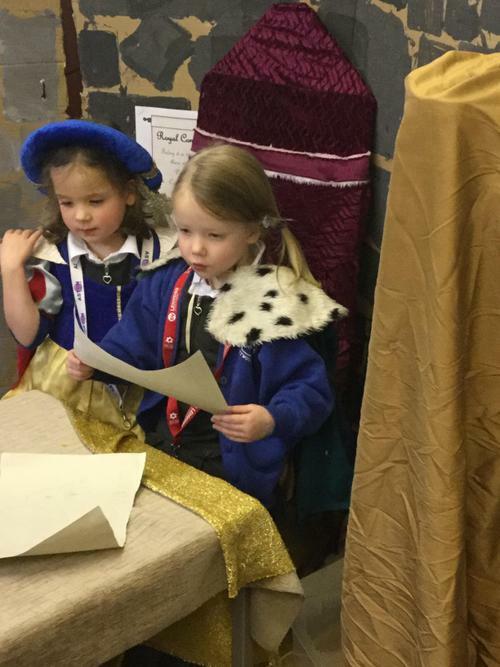 If you have any books, leaflets or photos of your visits to any castles, please do share them with us as we would love to know and share the knowledge with the other children. It's almost time to see our show.Thank you so much for sending the costumes in today as we are going to be doing a dress rehearsal early next week so we are ready for the big parent performances next Tuesday 11th December and Wednesday 12th December at 9:30 am. We hope that you enjoy it as much as we have we have worked very hard trying to remember all the songs and all the actions and all our words! 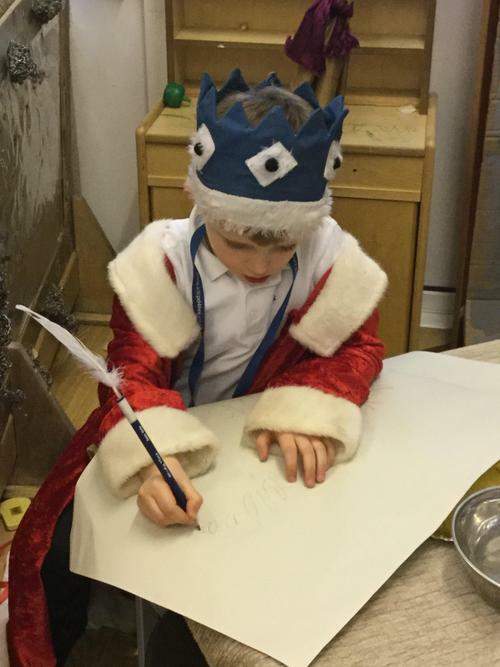 As we know the story of baby Jesus, we have been immersing ourselves in other Christmas activities such as making Christmas cards and writing lists for Santa using sparkly gel pens. 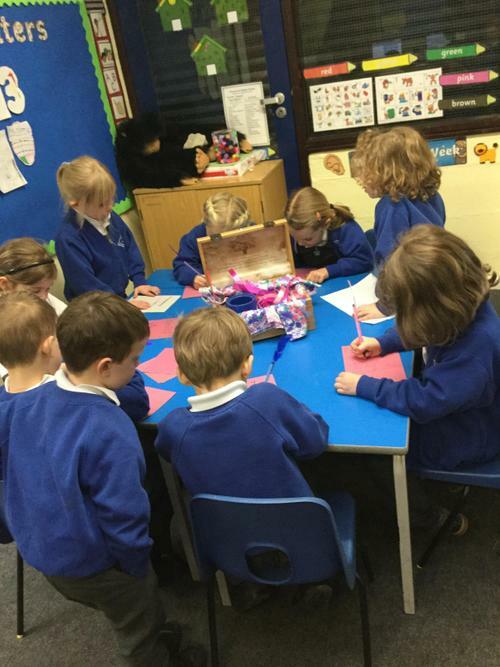 The Post Office has been very busy wrapping and sending presents and cards. 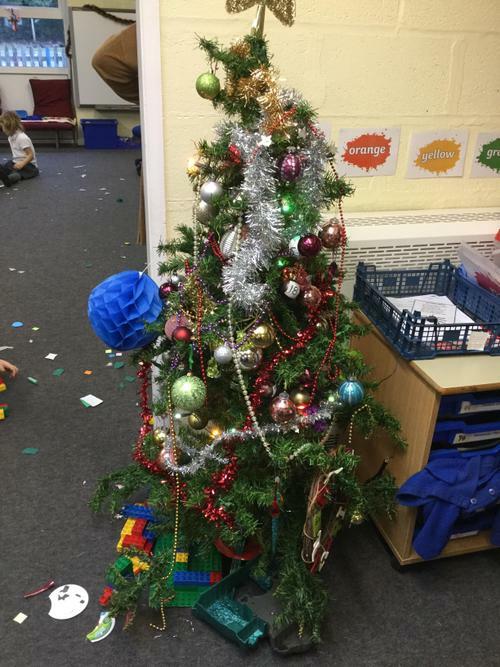 We even decorated the EYFS area and it looks just great. 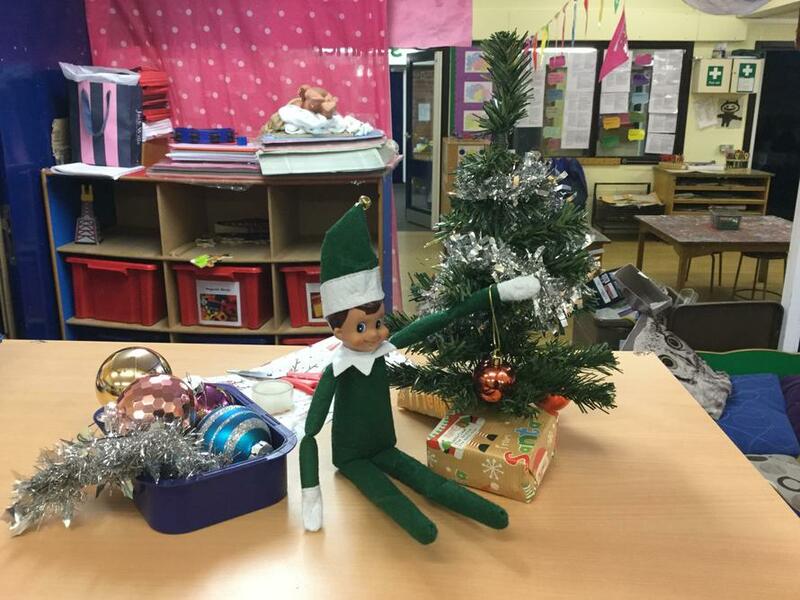 We have even had a visit from one of Santa's elves. 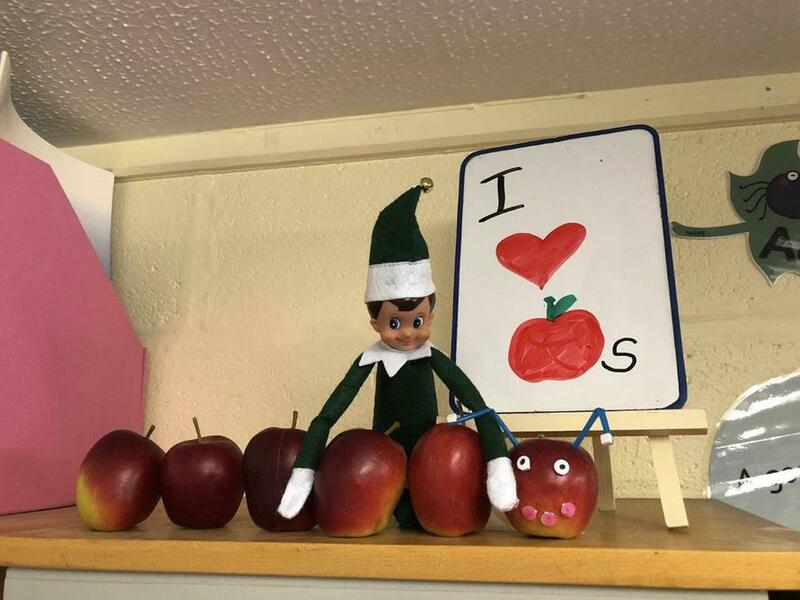 He has been appearing around the school looking out for fabulous children and he came to Apple Class and Cherry Class. We were very excited to see him of course! 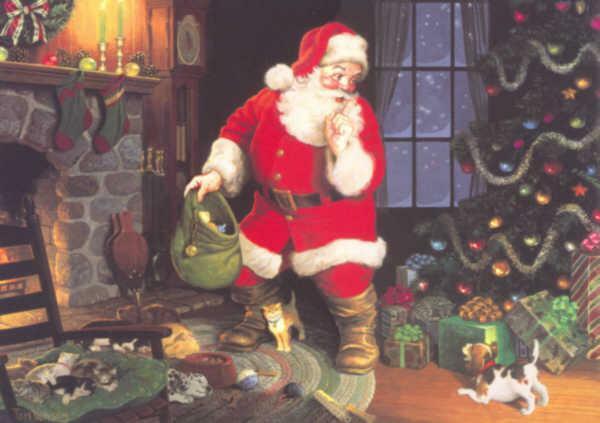 Ssh....It's nearly time for Christmas! 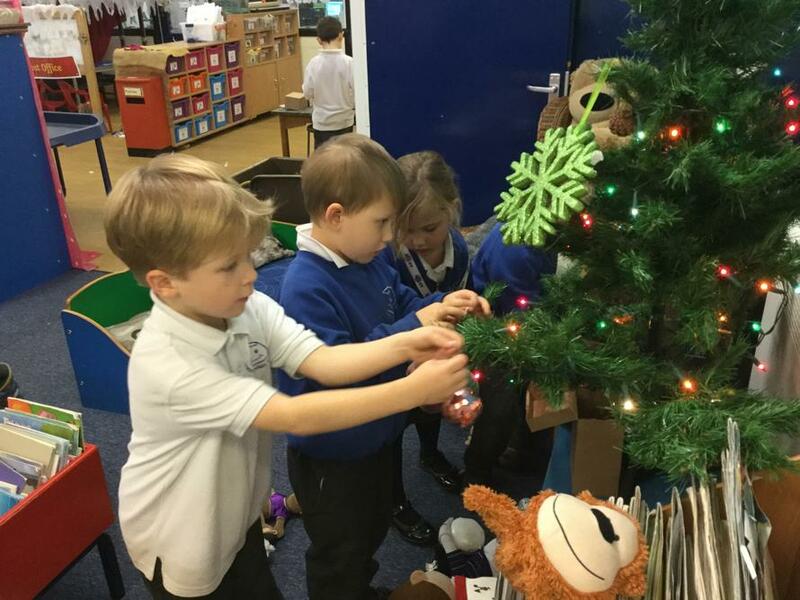 Although it's still only November, we have started learning all about the first Christmas and preparing for our Christmas performances which will be in a few weeks. We do hope that you can all come. It is important that we have all our costumes so please could you send them in by Friday 7th December...that would be great! Some of us have been learning our lines and have already memorised them. We know most of the songs and you have probably heard them at home being too. Once they get into your head, you can't get them out. Even the grown ups are singing them constantly. 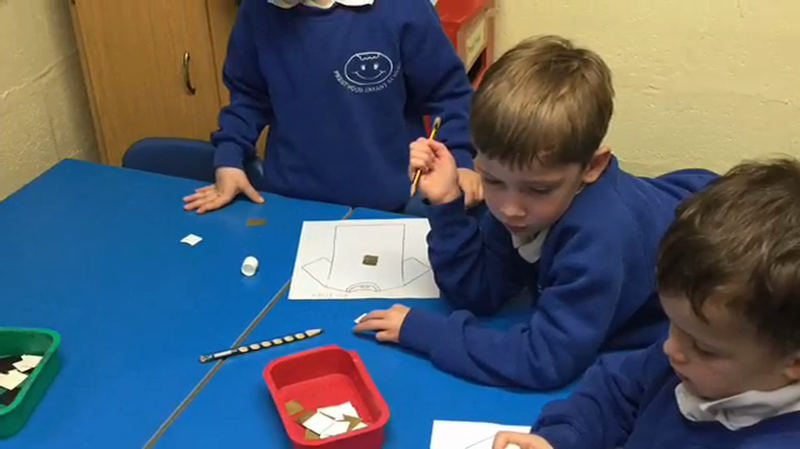 As well as that, we have also been learning about adding numbers and finding different ways to make a number. Perhaps we can show you at home if you ask. 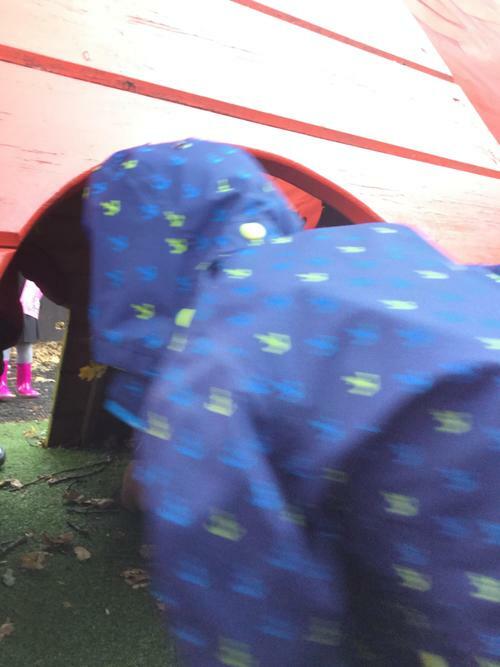 Its been grim and rainy this week but it hasn't stopped us learning. 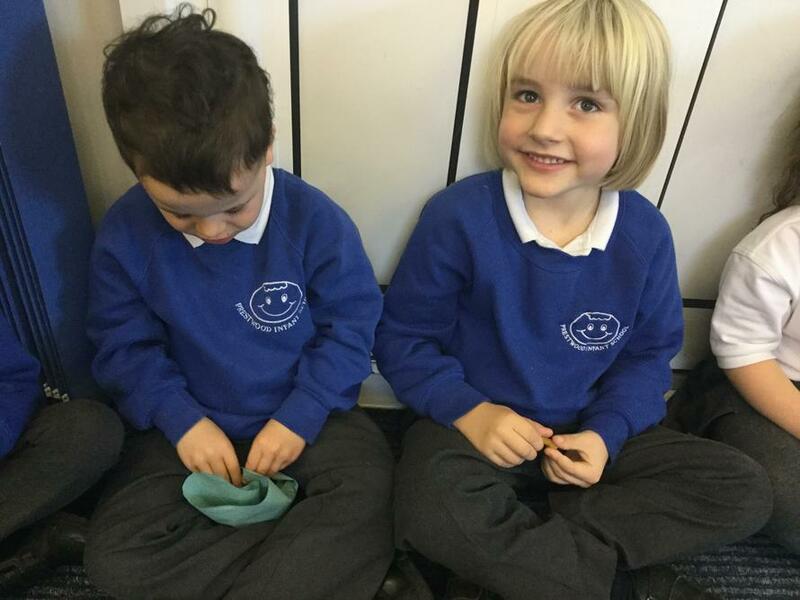 We have even learned to get better at tidying up the toys that we use. 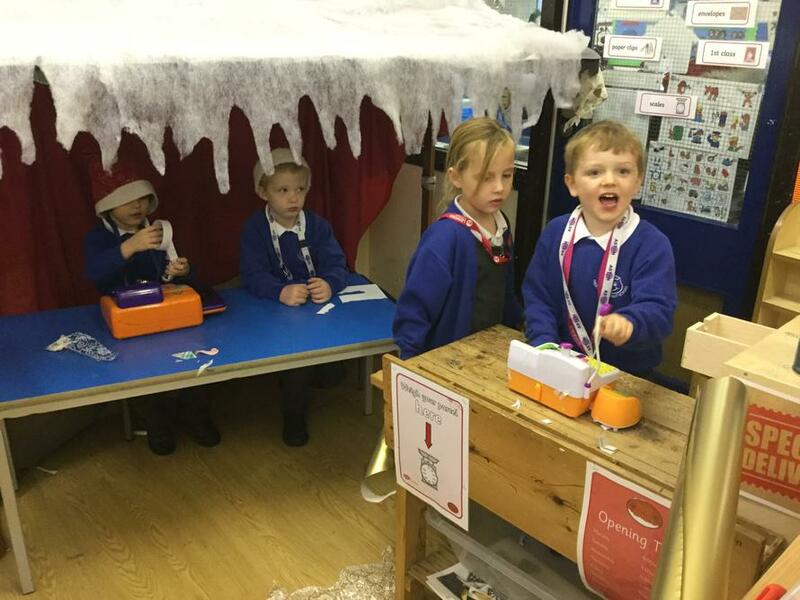 We've created a winter collage and the Role playing Post Office is still very popular. 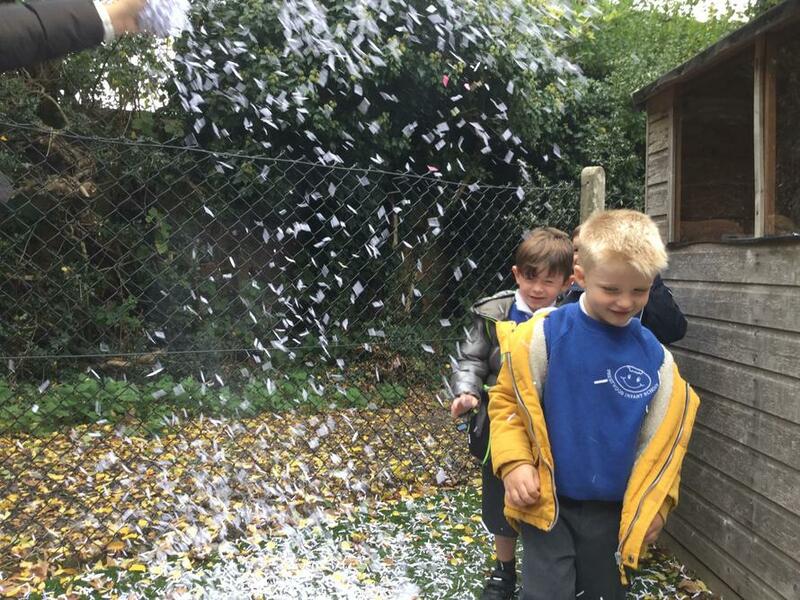 We had a go at sorting the seasons and this week we collaborated to put on a show for each other. 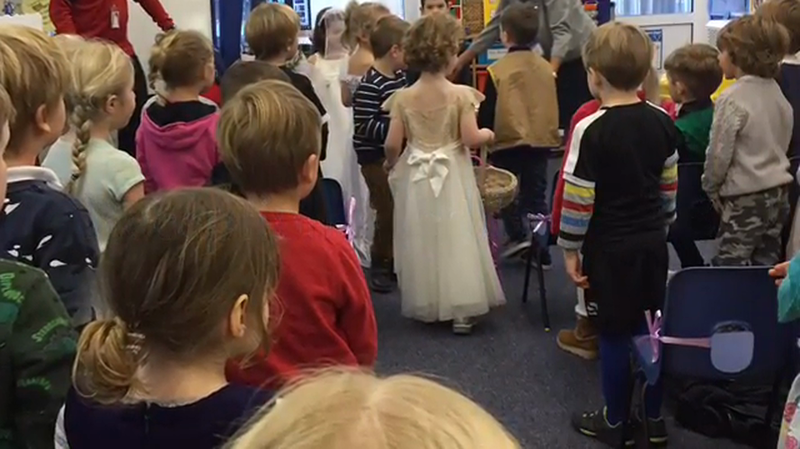 This week of learning all about weddings ended with our beautiful EYFS wedding between Anna and Tyler. What a marvellous couple they made. We were their guests and we really enjoyed watching them get married (pretending, of course!). Isaac read out the vows as he was the vicar and Jakey took all the photos. He was a very lively photographer and everyone wanted to be in his shots. Ronnie was Tyler's best man and held the special little rings made from tin foil. Lily and Orla dressed up as bridesmaids and sprinkled confetti down the aisle. After the ceremony Anna and Tyler signed the book and cut the cake. Hanna read out poem that we had made up in class about getting married. The special couple had a first dance and then we all joined in the party! What a wonderful time we had. Especially when we got to eat our wedding biscuits that we decorated with icing and hundreds and thousands. We love weddings in Reception and this was one of the best. 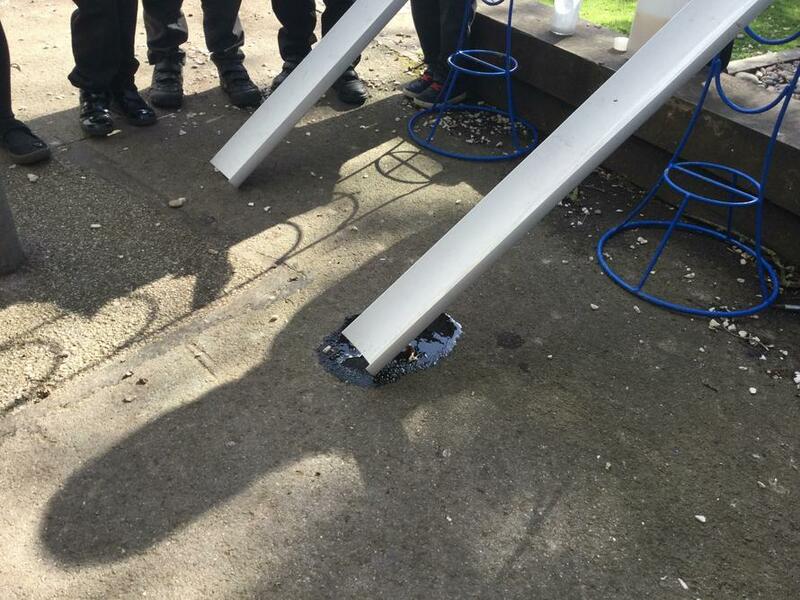 Weddings are great fun and now we know why. This week has been all about birthdays. We were lucky enough to celebrate Mrs France's birthday this week so it was the real deal. 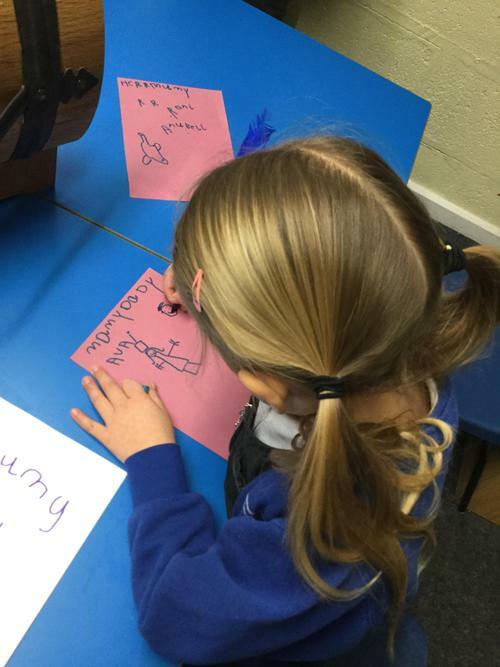 We have made some birthday cards and had a go at writing. 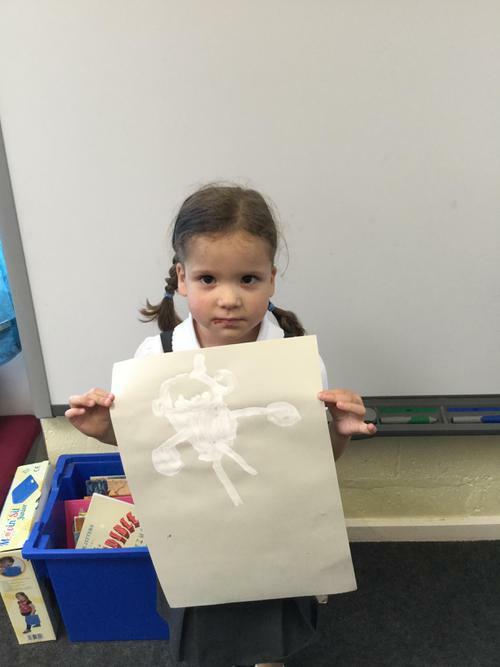 We have cut out and glued our favourite toys onto a wish list and so practising our cutting skills. 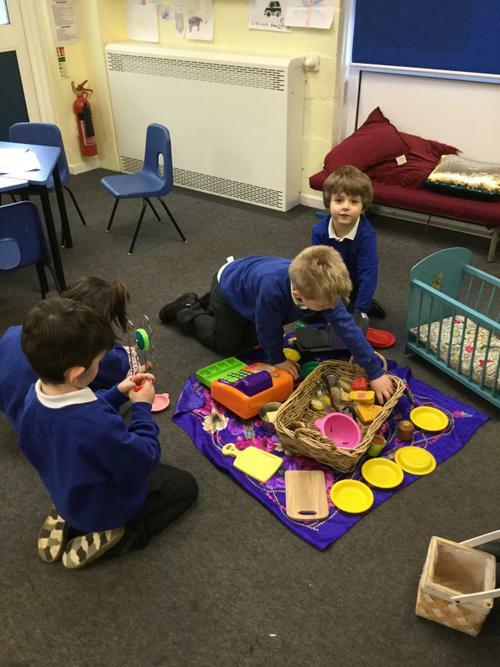 We had a go at making pretend cakes in the sensory area and the Home Corner has been full of parties all week. This week the theme across the whole school has been Diversity and we have enjoyed taking part in the assemblies. We have learned that although we may look different, we are the same inside and we should treat all people with kindness and equality. 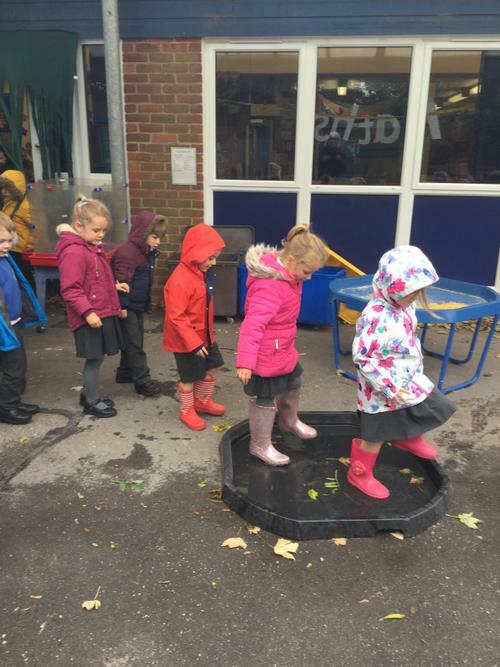 Our new topic this half term is all about celebrations so what a way to start than with the upcoming festival of Diwali. This festival of lights is celebrated by Hindus around the world so we thought we would also join in. We now know the ways Hindus celebrate Diwali with fireworks, diva candles, decorations and special food. 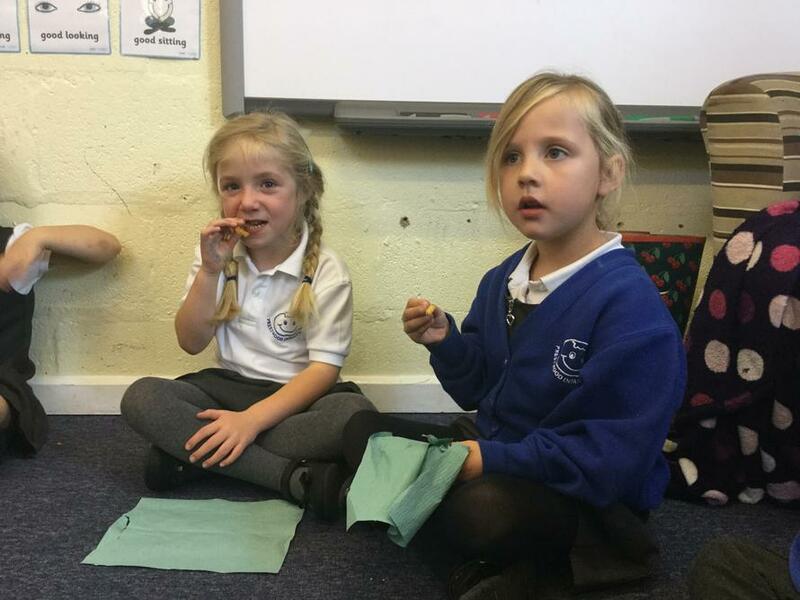 We even tried some Diwali food as Mrs Smith brought some things in for us to taste. We thought it was tasty and spicy. We are also making some diva lamps from clay. 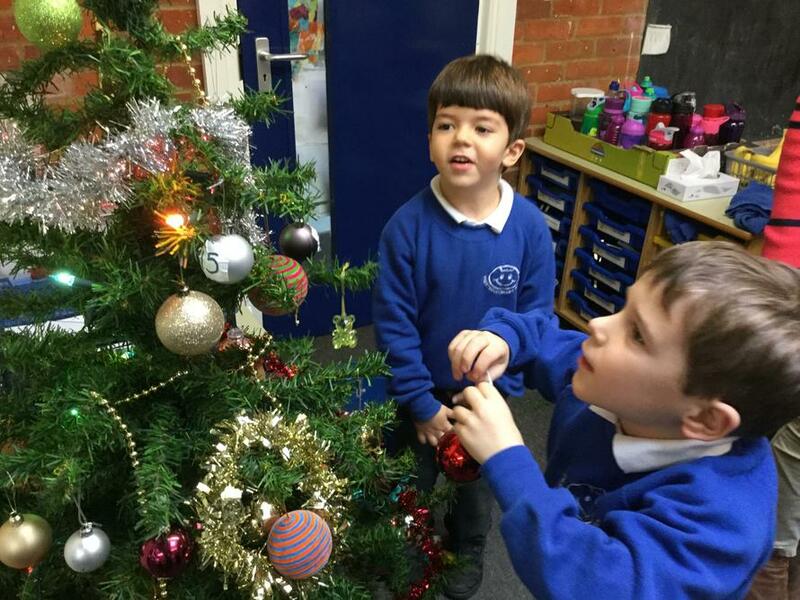 We will decorate them next week - how exciting! Please send us your old recycling for our junk modelling box. We love it and we love to make new things from it. We also need any unused envelopes and writing paper or cards that you may have and don't need anymore for our role play Post Office area. If you have any, we will gladly have it. Many thanks! The final week was full of fun with our circus workshop at the start and ending with a Teddy Bear picnic in the hall with our teddies. 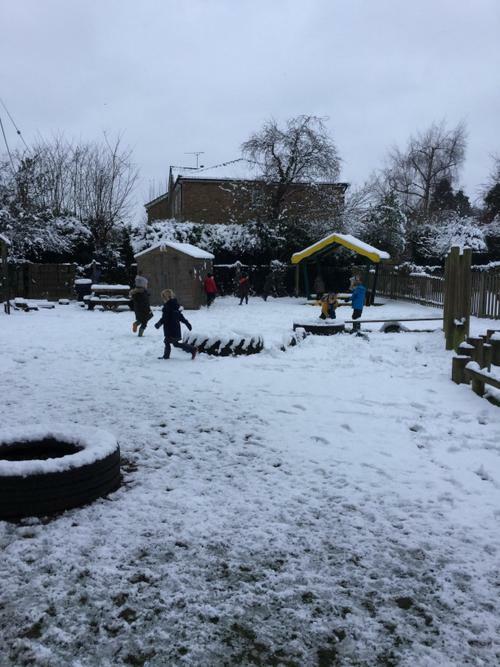 We are certainly looking forward to the half term and a little rest from all the fun we are having at school. 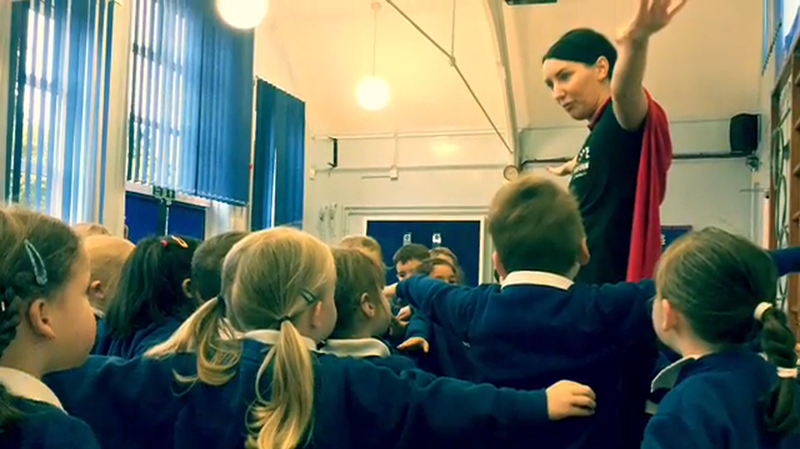 The children spent some time with a circus ringmaster who taught them how to perform various circus activities. 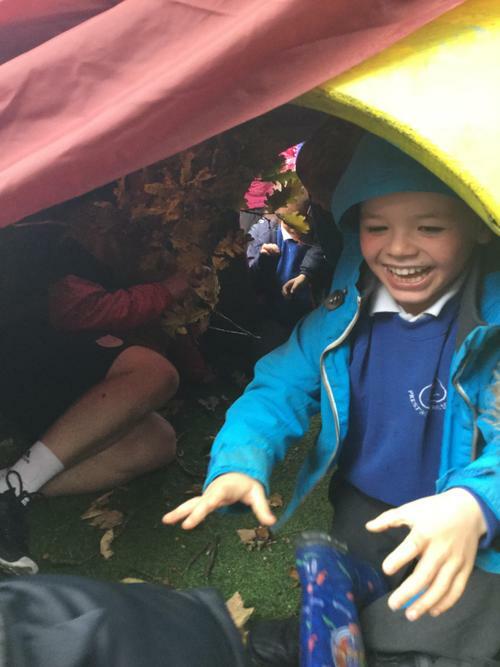 The children then became clowns and had to make the star clown laugh as he had sadly lost his laugh and was feeling very sad! 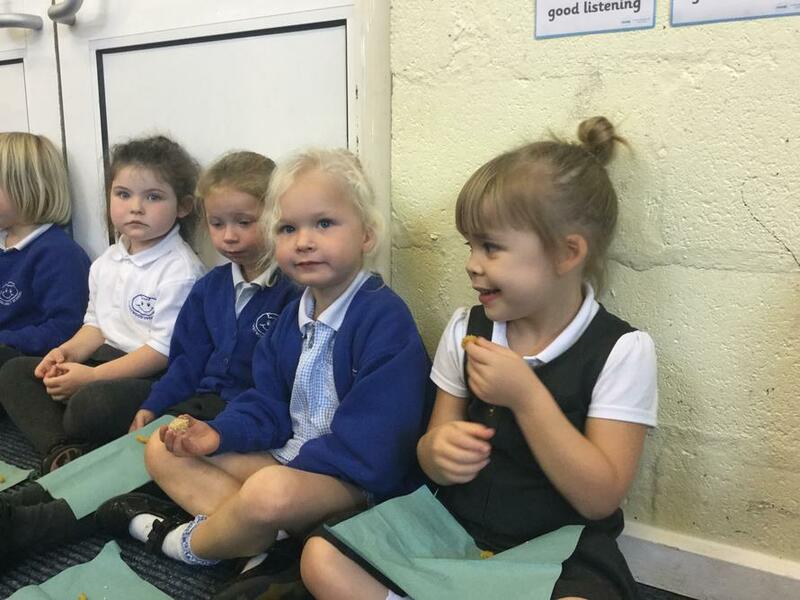 This week the Reception children went along to the Harvest Celebration assembly where Deniol (our vicar) explained what Harvest was all about. 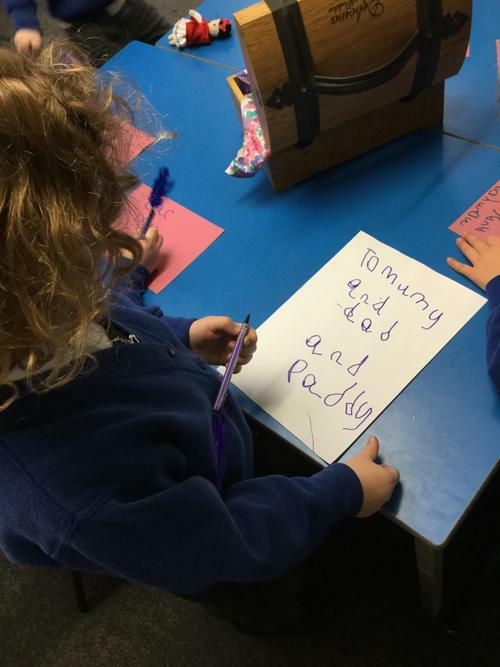 It was very interesting how he used the letters from the word HARVEST to make other words that were important and helped us to understand how fortunate we were to have food and we really enjoyed eating out lunch that day and felt very grateful. 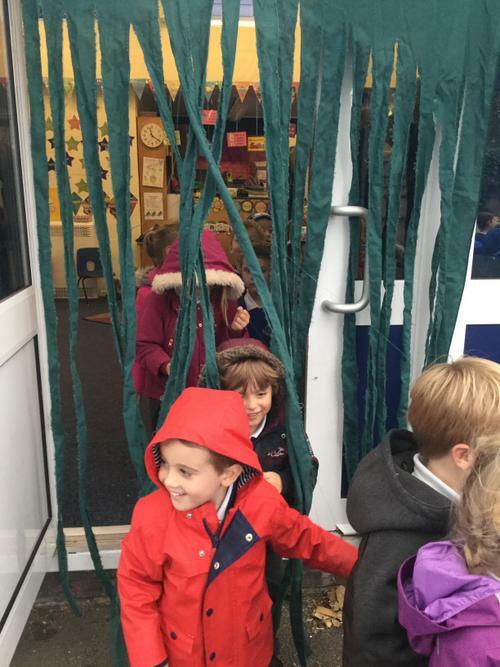 The children also performed their Harvest Poem to the rest of the school which was exciting as they have never done anything like this before. They were (it has to be said) marvellous, using their voices clearly as well as performing all the actions. Well done! 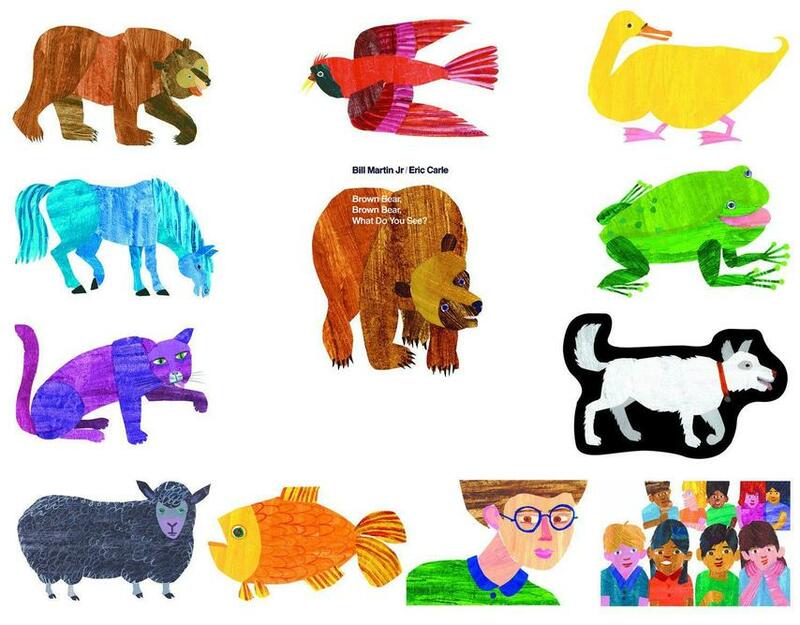 This week we looked at the book by Bill Martin and illustrated by Eric Carle. It was very good and we made a list of the animals in the book. 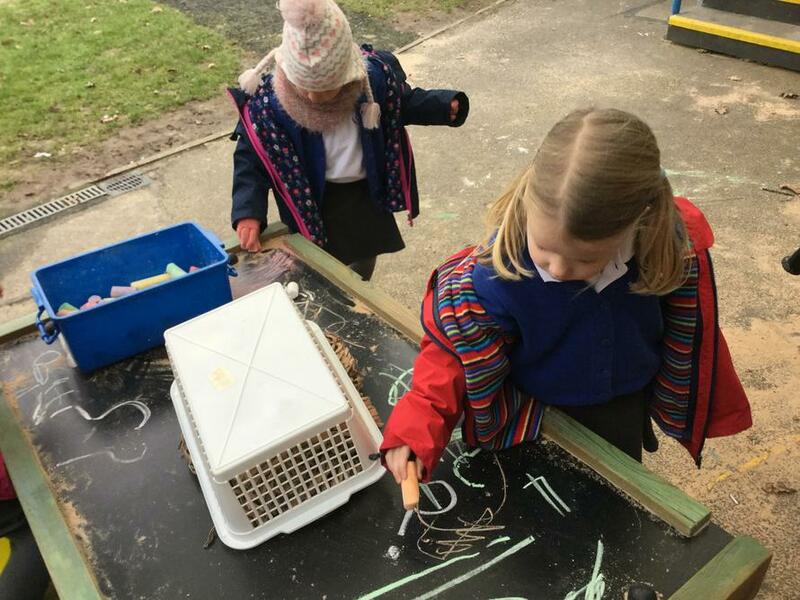 In our literacy lessons we drew our own creature and tried our hand at writing what it was now that we are doing daily phonics sessions. 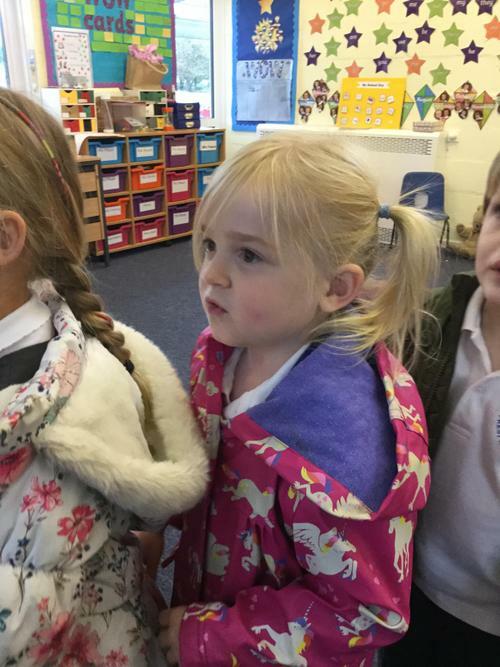 In maths we are counting to 5 and then to 10. We are trying to make sure that when we we count, we count each item by touching it so we remember not to count it again. 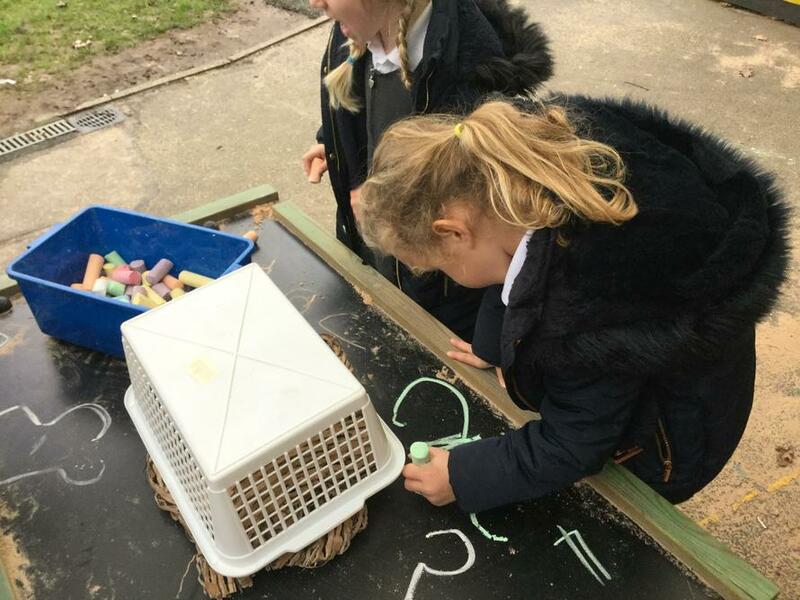 We are also trying to remember that when we get a number of cubes out, even if we move them around and muddle them up, there are still the same number of cubes. 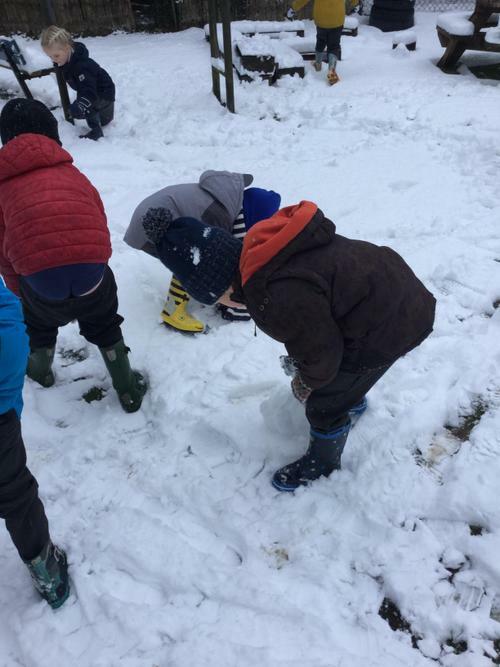 We are also practising looking at dots on a dice and saying how many there are without counting them first. Phew! Busy week. Please do remember that if a reading book has been completed and the reading record has been signed, then books should be placed in the Reading Book Box so that they can be changed. Books left in bags and trays will only be changed if it is the child's turn for reading with a grown up that day. Please can you make sure that children bring their books and reading records each day. 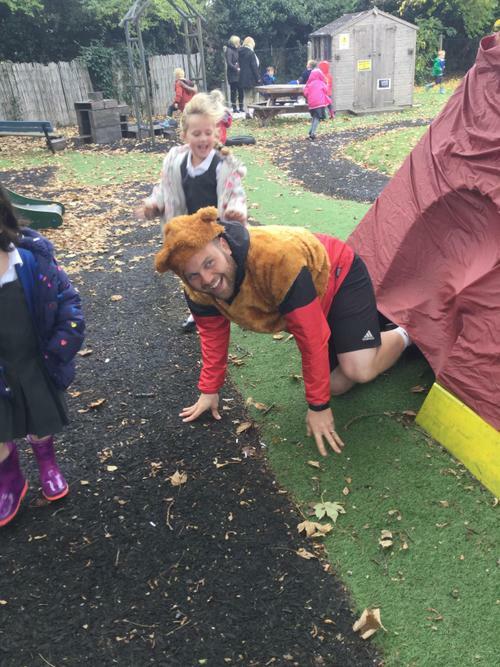 The children tried Daddy Bear's porridge and thought it was "amazing", "yummy" and "nice". 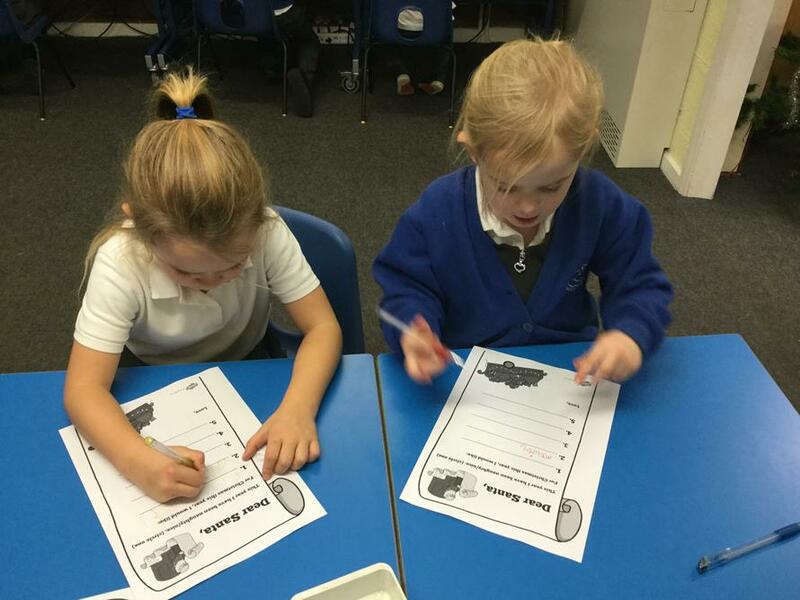 This week we have also completed a whole week of phonics and covered the first phase 2 sounds 's' 'a' 't' and 'p'. 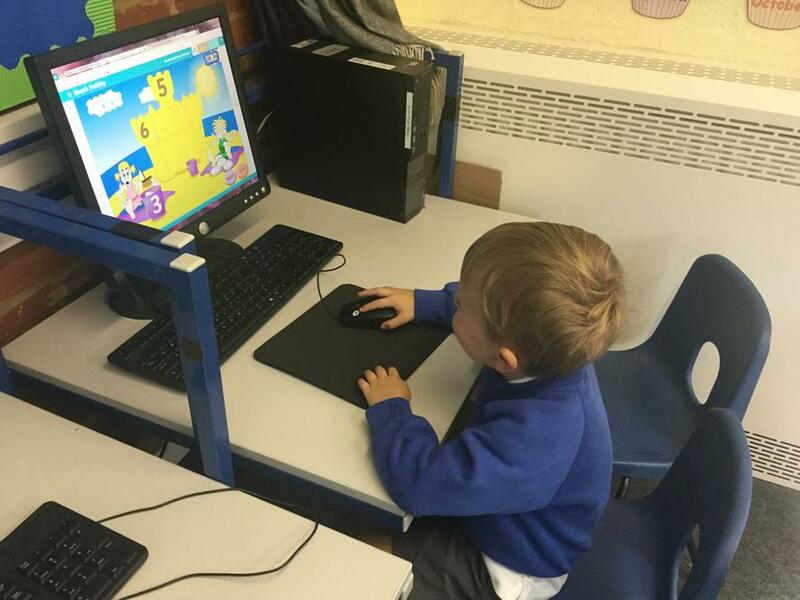 Please look on the Phonics Play Website for some sound games. You can also watch Mr Thorne's phonic videos on You Tube. In maths we looked at patterns and repeating patterns using shapes and colours. Perhaps you can spot some patterns or make your own? 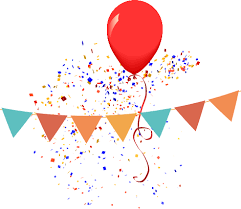 We also joined in with whole school assemblies as we went along to the Singing Assembly on Monday and we also went to Celebration Assembly last week. 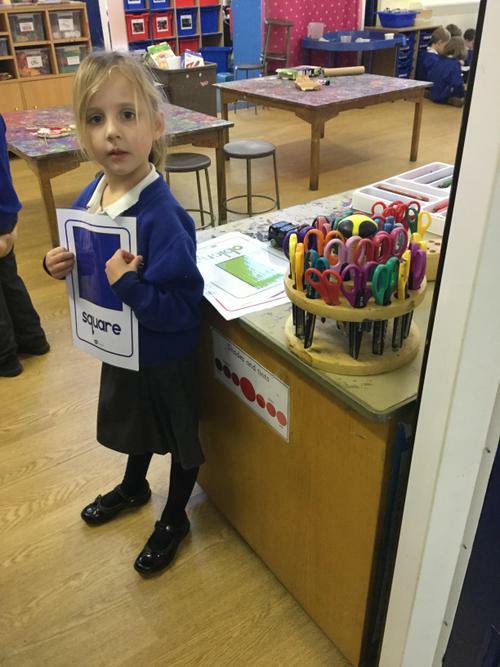 Please do look at the Powerpoint presentation above for information that was given during the EYFS Presentation Evening. If you have any questions do not hesitate to ask our lovely staff who will be happy to help you. 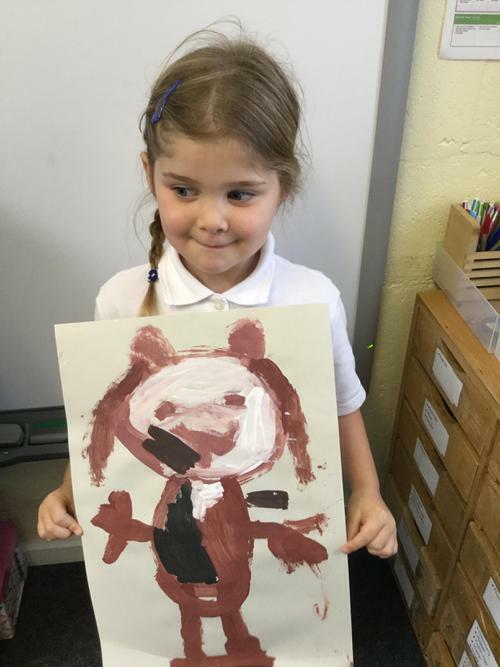 Our theme this half term is all about bears. 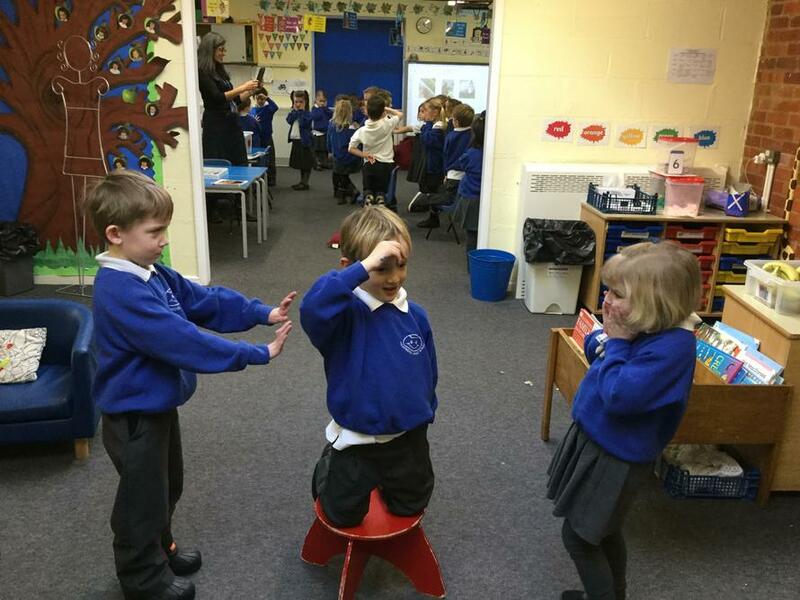 Over the next two weeks we are going to be exploring the story of Goldilocks and the three bears. We have already used the story sack and read a book. 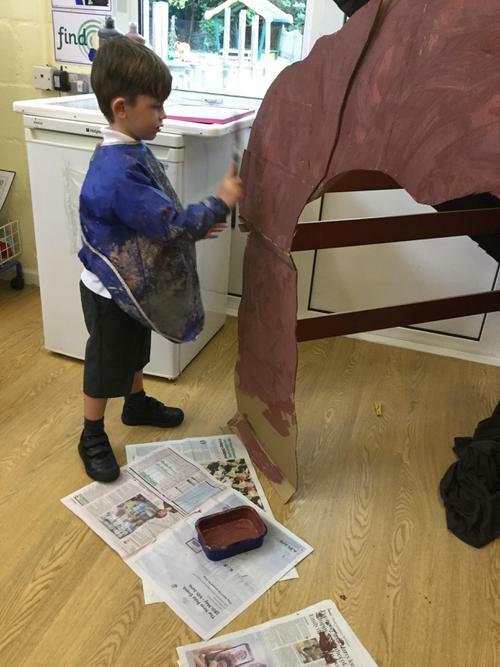 All our activities are based around this story so we have a bear cave to role play in and we are painting bears as well as ordering bowls and chairs and lots of other exciting things. 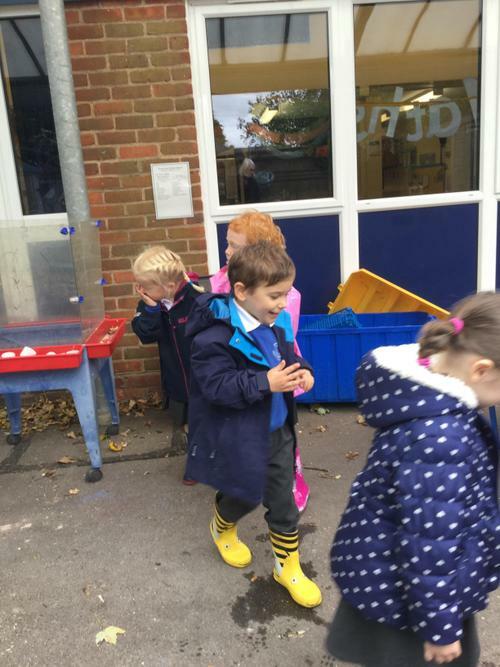 We have also started singing counting songs and practising counting on our fingers and recognising the number of dots on a dice without counting. Tricky! We are learning to listen with Lola the listening leopard. 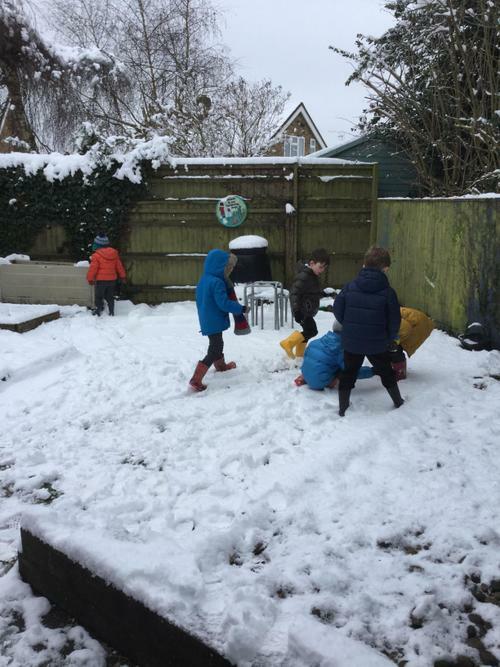 She has some four simple rules that we are trying to practise and perhaps you can have a go at doing them at home as well. Some of the things we have been doing. 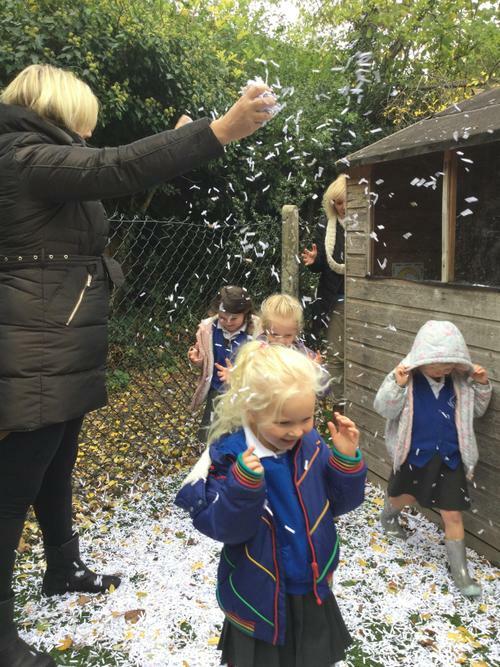 Welcome to your child's first year at school and what an exciting year its going to be! Its going to be a year of firsts in all manner of ways, we can't wait to get started. 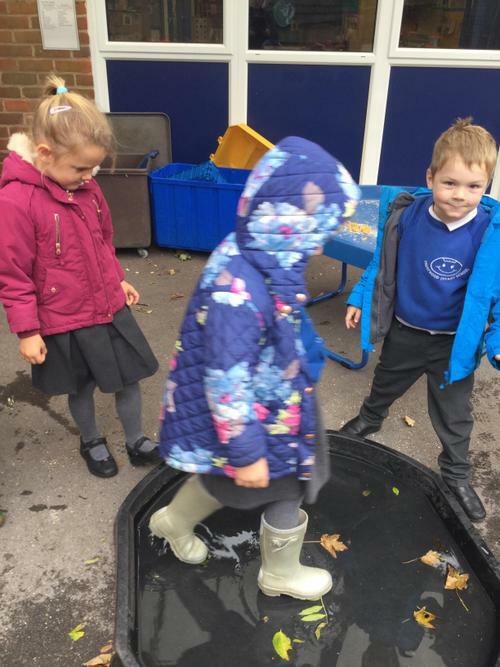 The children have already been exploring the different areas of EYFS. Please look at the Topic Map below for a sneak peek at the things we are going to be learning this term.